The 2017 Overwatch Summer Games event can be summed up in two words: Ranked. Lucioball. Heroes, grab your rollerblades and sound-amplifying guns - it's time for the revamped Overwatch Summer Games. The 2017 version of Overwatch's first-ever in-game event will feature new skins, sprays, emotes, and even a new stadium in which to play Lucioball, as well as the return of last year's limited-run cosmetics. Game director Jeff Kaplan specifically teased skins for Junkrat and Mercy, calling the latter one of his very favorite skins Blizzard has produced. He also said Widowmaker and McCree players will be "blown away" by what's coming as well. If you missed out on the special skins which were part of the 2016 Summer Games, good news: Blizzard is making those available via credits (a change from last year, when it was basically just luck of the draw), and has discounted them down to regular loot box pricing. 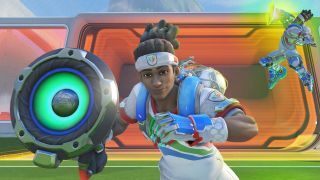 Last but certainly not least, Lucioball makes its triumphant return, albeit with some tweaks to make gameplay feel a bit more fair. You'll no longer be able to shove (or as Kaplan puts it, "boop") enemies out of the way, and Lucio's ultimate ability no longer pulls the ball toward him. Instead, you'll become faster, your alternate fire will recharge quicker, and you'll jump higher. A new ranked version of Lucioball will also be available, and placing within the top 500 players in your region will net you an exclusive spray. All in all, it sounds like a much more refined version of the 2016 Summer Games, which... yeah, I suppose that's what it is. But hey, considering how popular that event was, that's definitely a compliment. The Overwatch Summer Games 2017 will run August 8 to 29.